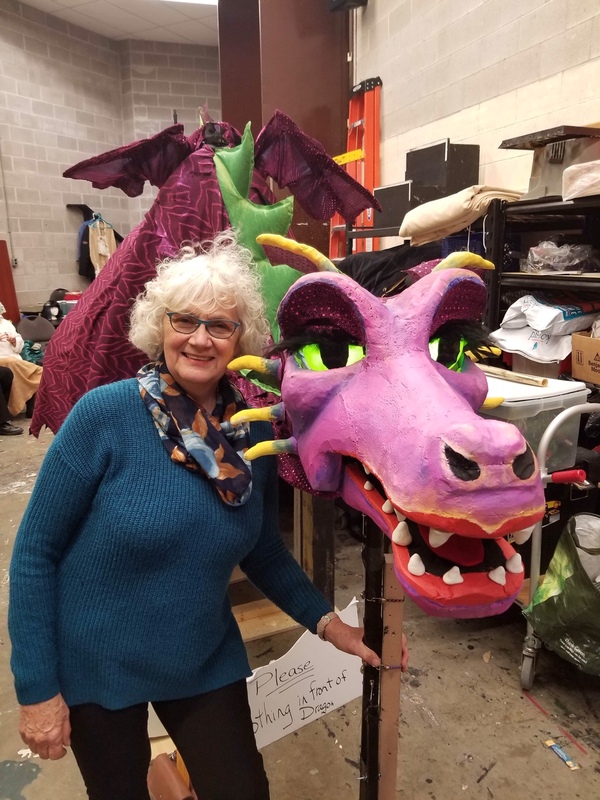 When Kempenfelt Community Players (KCP) announced Shrek the Musical as their adult show for the 2018-2019 season, set designer, Brenda Thompson, knew she had her work cut out for her. While each theatre set presents its own challenges in terms of design, the set for Shrek requires something extra: a massive, walk-around dragon puppet. It was Brenda’s job to take the concept from a design on paper to show-stopping reality on stage, and given her background, she was just the designer KCP needed to handle such a monumental task. Brenda began sewing at age eight, creating custom drapes, clothing, and costumes. In her early 30s, she apprenticed as a cabinetmaker, honing her building skills. She later went back to school for interior design, learning space planning. Brenda also discovered a talent for drawing, painting, and sculpture, which lead to a diploma in Fine Arts from Georgian College. All of these skills came into play during the planning of Dragon’s design. Brenda began gathering materials during the summer. Due to the sheer magnitude of the dragon, construction had to wait until KCP’s warehouse space was available in November after Alladin Jr. moved from the rehearsal space to the stage. Brenda had a basic design in mind and built on that concept, often spending countless hours problem solving the various elements of the dragon. She went back to the internet for inspiration and brainstormed with Stephen until they worked out a solution. Dragon’s eyes proved to be another challenge. Dragon needs to blink her eyes to provide character for her onstage persona. Stephen Bainborough reached out to former colleague, Trevor Charles, a tech teacher at Bradford High School, who formed the metal base for the eyelid system and formed the eyeball out of fiberglass. Brenda then cut a dollar store ball in half to go behind the form, giving Dragon her beautiful green eyes. She then fashioned a pocket to fit behind that to hold LED lights and a switch to turn them on and off. Fabric was attached to complete the eyelid and her beauty was enhanced by the use of soft, black feathers for her eyelashes. Brenda constructed the head out of rigid styrofoam house insulation, which is easy to carve, and then figured out how to make the jaw move so Dragon’s mouth could open and close. Next came Dragon’s body. “The inside structure is mostly plastic plumbing pipes, and permeable garden hose from the dollar store, which gives her flex and it also has texture on it so the fabric will stick to it,” said Brenda. Dragon is operated by four puppeteers who are secured inside the structure in a harness system made from old backpacks acquired from Value Village or scrounged from family and friends. The puppeteers operate the eyes, jaws, and wings via a system of pulleys using drapery cords, and sticks to move her head and tail. Brenda came up with an ingenious idea of using pipe wrap for the tail with wire inside and joining that to the body to give the tail flexibility. She then did the same thing to attach the head to the body system. The Gingy puppet, designed by Ann Fox, turned out to be a source of inspiration in the creation of the dragon. The stuffing for Gingy was perfect for Dragon’s spine, and through Ann, Brenda discovered cloud clay, which was the ideal, flexible material for Dragon’s horns. Brenda needed something soft enough for the horns so that none of the actors or crew would be accidentally injured if they came into contact with Dragon’s face. 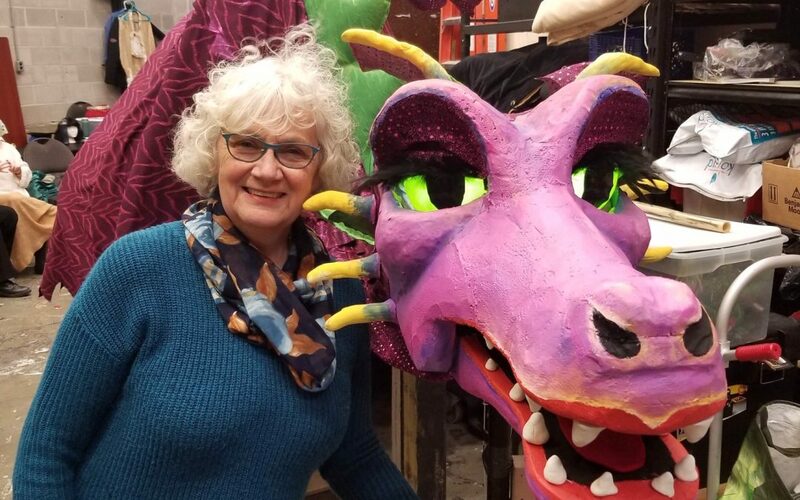 KCP is fortunate to have Brenda Thompson’s obsession and imaginative design skills available to them for the creation of Dragon, who has become a favourite of the cast and crew. Everyone who passes by stops to admire the craftsmanship that brought Dragon to life. Sandy Bishop is a local freelance writer-for-hire and on-stage white rabbit who is perpetually late. You can find out more on her website at www.writesational.com or on Facebook @ sandy bishop – freelance writer.